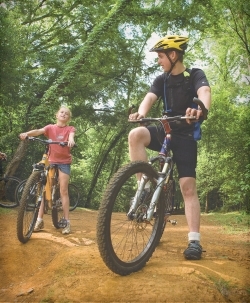 The trail system includes more than eight miles of mountain bike trails hidden in 30+ acres. The trails are primarily advanced with a few expert level sections. Features include steep climbs, rooty sections, tight and twisty routes, smooth and flowy single-tracks, jumps, berms, wooden structures and a bowl.